Kemetic theology and high spiritual culture, is in many ways, an early antecedent to the modern hip hop aesthetic. Hip hop, in its original intent, involves taking bits and pieces from a wide variety of musical soundscapes to create something exciting and new. Ancient Kemetic spiritual psychology is an amalgam of many spiritual traditions from West, Central, South and East Africa. 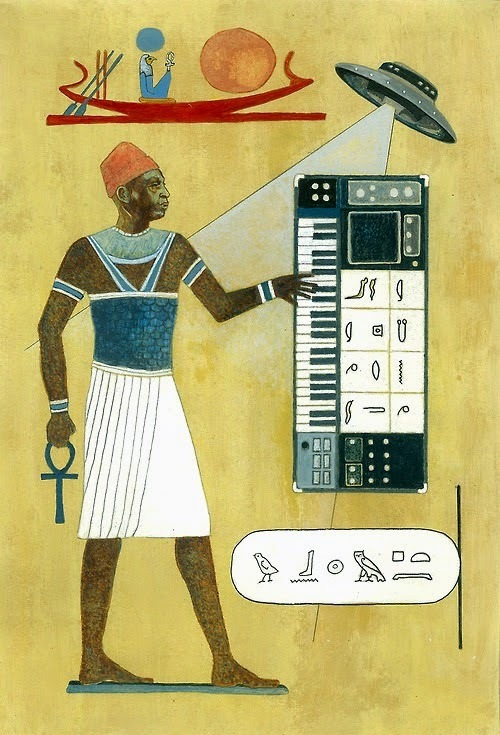 Kemet is a remarkable synthesis of African thought, just as hip hop music at its best is a remarkable synthesis of Black musical traditions. Listening to the power-source root recordings of Marvin Gaye, Bob Marley, Peter Tosh and many others trained my ear to the point where I now have creative sampling ideas that have never been utilized (to my current knowledge). I can listen to songs from any genre of music, and point to specific sections of a song that can be looped to create a new and potentially powerful auditory experience for the listener. I can intuit where to cut into the nucleus of a song to release the atomic energy inherent in the track. Now I need to learn how to use ALL of the technology that allows me to actualize what I hear in my head (lol). At any rate, following the Kemetic way for real means that you have to develop the kind of mind akin to a classic hip hop producer's. This is different from the mind of a hip hop consumer with a big Ankh chain and a long Kemetic name to over compensate for a small Kemetic mind.